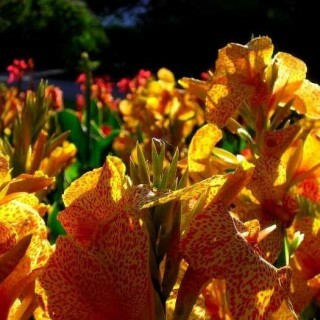 Mixed Canna Lily seed, common garden and park varieties. Each packet contains 20 seeds. Photo by Dale McDonnell (CC BY-SA 3.0). These ornamental Canna Lily seeds are a mix of varieties commonly seen in parks and gardens around Australia. The spent leaves of Canna Lily are great for adding bulk to composts and their flowers produce pollen and nectar which attracts beneficial insects. The colourful flowers are also great for sprucing up a dull spot in the garden. To get your Canna Lily seeds to grow you'll need to take a toe nail clipper and holding the seed firmly chip off a small section of the hard seed coat so you expose a section of the white flesh below. Then take the chipped seeds and soak in water for 48 hours. After soaking plant them into pots containing a good quality mix, 13mm deep. After they grow and fill the pot, plant them out into the garden, spacing each plant about 30cm apart. In the tropics you can sow Canna Lily seeds all year round, but watch out because they can become weedy if not kept in check (they can spread quickly via their underground rhizomes). In the subtropics Canna Lilies still grow well but will tend to slow down in growth and die back a bit during Winter, sow the seed anytime during Spring or Summer if you live in the subtropics. In temperate areas the seeds should be sown during Spring, they'll probably die back during Winter but you can leave the rhizomes in the ground and they'll re-shoot the following Spring, protect the rhizomes with a thick layer of mulch if you experience temperatures below freezing. If you live in an area with really icy Winters, you'll need to dig up the Canna Lily rhizomes and store them indoors over Winter or they'll die and rot in the ground, although most Australia gardeners won't have to worry about doing this.